It has been chanted. He has been used as the scapegoat many times, and it looks like the fans in Vancouver will finally get what they want, well what they want when they are losing at least. Canucks management has been entertaining offers for their All-Star goalie, Roberto Luongo. Many thought Luongo would be traded leading into this year’s Draft. Well, the Draft has come and gone, and Luongo is still a part of the Canucks’ organization, and things could stay this way for some time. 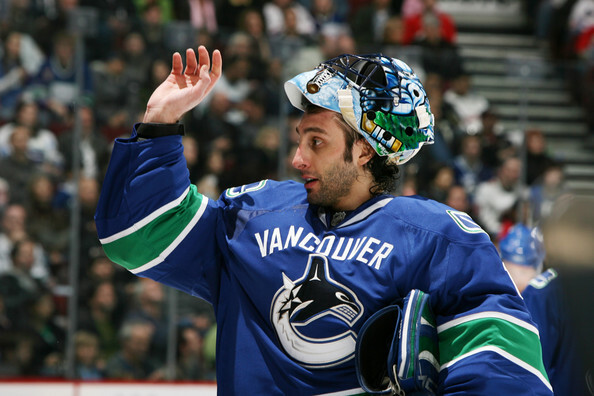 There have been three teams reportedly in the talks for Luongo. The Toronto Maple Leafs, perhaps a more media heavy and fan scrutinized organization than Vancouver, don’t know if that will work too well, the Chicago Blackhawks, the team that has tormented Luonogo for the past few season, might be a little weird on the other side of Chelsea Dagger, and the Florida Panthers, which would serve as a sort of reunion for Luongo. Luongo has a cap hit of $5,333,333 for every season until the 2021-2022 season, and becomes an unrestricted free agent after. So in short, where ever Luongo ends up he will be there for a long time. At the moment Canucks’ General Manager, Mike Gillis , is in the driver’s seat and will not pull the trigger until he gets what he wants. If it comes down to it, he could even keep Luongo. But things do not seem to be heading that way, it is just a matter of Gillis waiting for the right offer that includes what he wants, and Luongo will be wearing a new sweater next season.